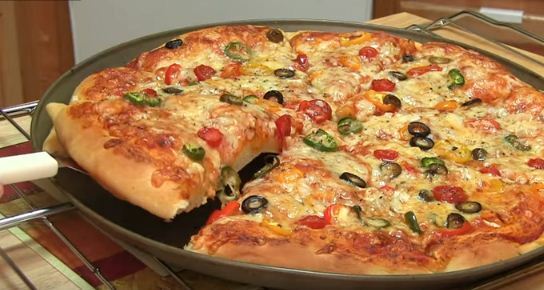 Home-made Pizza Recipe: Kenyans enjoy Pizza as a luxury meal that can be indulged in, once in a while. However, with this simple recipe one can be able to prepare this sumptuous meal at the comfort of their homes. Add tomatoes and tomato paste then lower the heat. Let cook until well blended and thick. Sprinkle some salt and black pepper and stir. Remove from heat and set aside for it to cool completely. Place the pizza bread on a flat surface and spread some of the tomato sauce over it. The layer should be thin. Carefully arrange the sliced cheese on top of the tomato layer and then sprinkle the rest to achieve an even layer. Arrange the belle pepper pieces, chopped onions as well as the ham on top of the pizza bread. Now gently place your Pizza into the oven and let cook until both the bottom and side brown. Remove from the oven and slice into desired equal parts. Your Pizza is now ready and can be served hot. Enjoy!